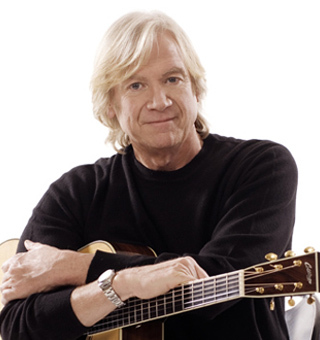 As the lead singer & songwriter of the legendary British rock band, the Moody Blues, Justin Hayward has written many classic rock hits, including “Nights in White Satin,” “Tuesday Afternoon,” “Question,” “The Story In Your Eyes,” “The Voice,” “Your Wildest Dreams” and “I Know You’re Out There Somewhere.” The Moody Blues have long been known for their haunting melodies, lush orchestral arrangements, and multi-layered vocal harmonies. Hayward’s best known song, “Nights In White Satin,” was featured on the band’s 1967 album, Days of Future Passed. This album has been recognized as a pioneering work, because it was one of the first albums to combine classical orchestrations with modern rock & roll. As a result of the impact of “Nights in White Satin,” filmmaker David Minassian has made a documentary film called The Story Behind Nights in White Satin, which will be screened this week (Jan. 6) at the 2016 Idyllwild International Festival of Cinema in Idyllwild, California. We are pleased to do a new interview with Hayward about the making of “Nights in White Satin,” his other Moody Blues hit songs, and his current projects. Before we start the interview, here is some information about the Moody Blues and Hayward’s additional work as a solo artist. Hayward has also recorded several solo albums, the most recent being Spirits of the Western Sky in 2013, which was released on Eagle Records (a division of Eagle Rock Entertainment, which also releases many concert and documentary films). In addition to touring with the Moody Blues, Hayward tours as a solo artist, accompanied by musicians Mike Dawes and Julie Ragins. DK: How did the documentary for “Nights in White Satin” come about, and how did you get together with filmmaker David Minassian? Hayward: David Minasian had done some things in the past for me and the band; we did a DVD together in Atlanta in 2013 that he shot. It was his suggestion to do the documentary about “Nights,” and I thought it was a nice idea. DK: What was your inspiration for writing “Nights in White Satin”? Hayward: At the time, I was just 20-years-old, and we were working on new material. We needed new material—we weren’t making it as a rhythm & blues band, that’s for sure. I came to the group as a songwriter—myself and Mike (Pinder) were writing songs. Mike was working on a lovely song called “Dawn is a Feeling” that eventually opened the album Days Of Future Passed. It was recorded a few months later to open the album. He asked me to sing it—I loved the song. 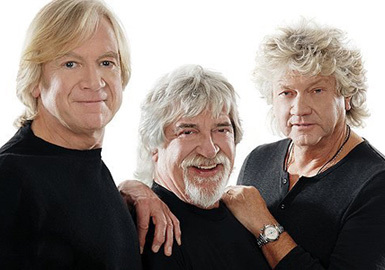 The Moody Blues (pictured l-r): Justin Hayward, Graeme Edge & John Lodge. Once we decided to do a stage show of a day in the life of one guy, then I wanted to write a counterpoint to Mike’s “Dawn is a Feeling” that’s about the night. Then I came back from a gig one night—I was living in a two-room apartment with our drummer and our girlfriends. I sat on the side of the bed and just wrote the two verses of “Nights.” At the time, I had no idea that anything would ever happen to it at all. The next day I took it in to the rehearsal room—we were rehearsing down in West London—and I played the two verses to the other guys. And they weren’t that impressed (he laughs). But then Mike Pinder, our keyboard player, had an instrument called the mellotron and he said, “play it again.” So I played it again and Mike played [the melody] on the mellotron. Then everyone could kind of see a part for themselves (to play) in the song. As soon as we did that, it started to make sense. Then we started playing it onstage. The song is a collection of thoughts of a guy…you know, me as a young man. I was at the end of one, big love affair and the beginning of another—those are the kind of things you say at that age (laughs). DK: Did you write “Nights” with your guitar, or on the piano? Hayward: I wrote “Nights” on the big old 12-string (guitar) I had. DK: Many of your classic Moody Blues songs feature orchestral arrangements. When you wrote a song, did you already envision that a song would have a string arrangement? Hayward: Later on in my career, I started [to envision] the orchestral arrangement as I wrote the song, but at the time…no. We were just trying to do something different as a stage show—to create songs that reflected our own personalities at the time. I wish I could say that there was a master plan to have orchestras and all this stuff flying around, to go in that direction, but there wasn’t really. I think we just got lucky—Mike (Pinder) had found the mellotron which certainly made my songs work. Before that, he was just playing piano and Vox Continental organ and it didn’t give us any kind of unique sound. The mellotron gave us an attitude and a twist on our songs that was interesting. Also, we were lucky enough to be on a great label called Decca (Records) at that time in London, and Decca had Peter Knight, who was one of the greatest romantic string arrangers in Britain. They put us together for the album. DK: “Nights in White Satin” was a hit in the U.K. in 1967, but it didn’t become a hit in the U.S. until 1972. How did that happen? Hayward: What happened in the U.S., was that radio then was dominated by the AM stations, and the idea of the 3-minute uptempo single. I don’t blame them, but they just didn’t go for “Nights” in America at the time (1967). 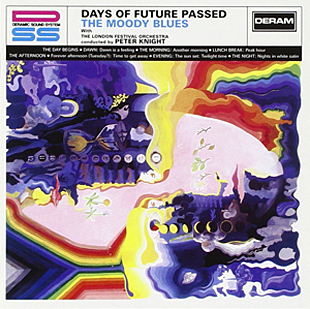 From Days of Future Passed, “Tuesday Afternoon” was released as the single, and that was the first hit for us off the album. After [the label] had seen that “Nights” had success in Europe, they released it in the early part of 1968. And it just kind of bubbled along…it was always there and people kind of knew it. “Nights” started to get play on FM radio stations, which really didn’t care about the length of the song or what the tempo was. So it was just bubbling along, and then eventually it crept up. White Satin” at the Royal Albert Hall in London, in 2000. In the end, London Records (the U.S. branch of Decca Records) tried to suppress it for awhile, because in 1972 we had new product out (the Seventh Sojourn album). It wasn’t really convenient to have “Nights In White Satin” coming back. But it seems the harder [the label] tried to do that, the more that “Nights” grew, particularly for FM jocks on FM radio. We were so lucky to come to America. Days in Future Passed was [originally] a demonstration record, to demonstrate stereo—it wasn’t any kind of planned career move for the group. It was a demonstration record, that Decca wanted to demonstrate their stereo systems that they were trying to sell. Nobody thought it would be a commercial album. What happened was, as soon as it was released in America, FM radio, which was just starting in America then, was desperate for [records] that had a really good stereo picture. The Beatles were doing great music, but they had the drums on the right and the vocals on the left. Decca’s idea was very different—it just happened to coincide for us, with the way FM radio was bursting out. DK: So part of the success of Days of Future Passed was the way it was produced and recorded, that its stereo recording was ahead of its time, and FM radio noticed that and embraced it? Hayward: Absolutely. I think the only record that came close to trying to do stereo in that way was probably “The Boxer” (by Simon & Garfunkel) that really took stereo seriously. At the time, I don’t think many A&R guys were taking stereo seriously. DK: Over the years, many artists have recorded cover versions of “Nights in White Satin.” What are your favorite versions? Hayward: Eric Burdon did a good version of it, with his group, War. But the best version of “Nights” was by Bettye Lavette, the R&B singer. Her version (in 2010) is the only one, I would say, that is probably better than ours. DK: “Nights” and “Tuesday Afternoon” are known for having great, beautiful melodies. Did you usually come up with the melody first? Hayward: Usually, it comes to me—I’ll have the first rush of the melody and some words together, that work together, in the first hour of working on a song. And then I’ll spend the next two months (laughs) trying to do all the rest of the pieces. So I suppose it’s 5% inspiration and 95% hard work. Usually, a good part of the melody comes, with a phrase, that starts to explain what the song is about. I wish I could say that I was an off-the-cuff songwriter. I think what Picasso said is right—inspiration exists, but it has to find you working. If I go into my music room and work for a day, it’s pretty sure that I’ll come out with something. DK: So on the first night when you wrote the first two verses of “Nights,” you came up with the melody and the title, right away? Hayward: Yes. I had all of the lyrics on that first night. I was able to write [“Nights in White Satin”] in one night. I was very tired and I wrote down the words. It’s always curious to be asked about the 10 minutes of what happened in your life [when I wrote this song]. I think I remembered how I wrote it. But for the first few years (after 1967) nobody really asked me about it, because nobody was really interested in what I did that night. DK: It’s amazing that a songwriter can create a great song in 10 minutes, and then 45 years later we’re doing an interview about a documentary film, about how you wrote this song. Hayward: I know (he laughs). I’m still trying to explain it. I’m still trying to analyze what happened in those 10 minutes! I can’t say that any of us in the group thought that “Nights” was going to be a big hit. And the only time we thought so was after we first recorded it for the BBC as a live session. We listened to it in our van as we were going to a gig. We then pulled over to the side of the road, and that’s the first time we heard it played back, and we all thought it was kind of spooky. There was something kind of strange about it. That’s the only time we ever thought, “maybe there’s something in it.” Originally we didn’t have much faith in releasing it as a song, but a couple people at Decca did and that’s why we released it. It seems to have resonated with a lot of people, so I’m very pleased about that. DK: I was listening to your albums, and I noticed many songs have rich, full harmonies with multi-layered vocals. Was that an important part of the Moody Blues sound? Hayward: I grew up listening to Buddy Holly and the Everly Brothers, and I loved harmonies, and thinking about harmonies and working them out. And when we came together as a group, we were very lucky to have four of us out of the five, have real good voices, and we each had a different register. It wasn’t that serious—it was just guys enjoying themselves, saying “let’s work out some harmonies.” To me, that’s what I remember most about the seven albums we made when we were all together. I wish we could say there was a plan—we were very lucky that four of us had good voices, each in a different register. Ray (Thomas) was on the bottom, Mike (Pinder) was just under me—I was kind of in the middle—and John (Lodge) on the top. It was a really nice combination. DK: Besides “Nights in White Satin,” what are your favorite Moody Blues or solo songs, that you love? Hayward: I love the things from the ’80s. I really like a song called “I Know You’re Out There Somewhere” and another one called “Your Wildest Dreams.” I think as records, they were the most satisfying to me. It was a great time in my life, and working with a great producer, Tony Visconti. Those two songs are probably my favorites. DK: I liked your solo album, Spirits of the Western Sky. Will your next recording project be another solo album, or a new Moody Blues album? Hayward: You’re thinking I’ve got a plan, Dale (laughs). I wish I had a plan—I’m just going to take what comes. At the moment, I’m offered so much work on the road, that I’m going to do that. I’m really enjoying that—putting the music in front of the people. I would love to do a new album; I have some new material and I would love to find the time to do that. And to do that, you have to do it properly. It is time consuming, because I play a lot of the stuff myself. So it takes me awhile to put a whole album together. But I’m sure there will be one coming along. In my future at the moment, I’ve got a Moody Blues tour which is looking great, and then a solo tour coming up after that. I’m lucky that enough promoters want to book us and the Moodies.